Description: What would you do if you were in the blockade of dangerous, deadly creatures one day? 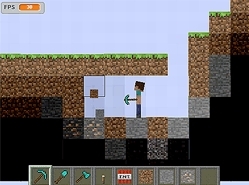 Access Minecraft Zombie Survival and have your own experience. How thrilling this game is! The story here is about a hunter who decided to spend the first night of his adventure in the Minecraft land. Unfortunately, this place is full of bloodthirsty zombies, and they've smelled the 'human'. Are you willing to help the man get out of the enemies' attack, players? Quickly ask him to activate the gun and start shooting bullets toward the incoming hostiles. They are too…CROWDED – do not let them touch the hunter or his Health bar will drop down rapidly. Your jobs here are just running, dodging, and defeating the zombies with the available weapon. Try to stay in Minecraft Zombie Survival as long as possible. Express all your capacities to conquer the foes and attain a win here! Mouse is to aim and shoot.